Made from the same top quality 6.3mm diameter yachting rope as the halters, this is a great item for bringing horses off the field. The rope features a correctly constructed eye splice to form a loop at one end and is backspliced with a leather popper at the other. 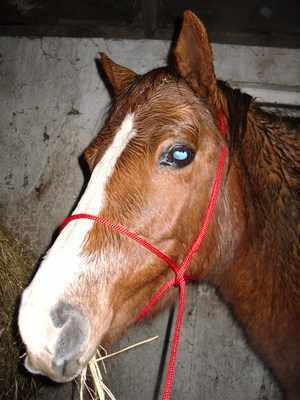 Quick and easy to pop over your horse`s poll, thread through the eye splice and bring over your horse`s nose. The loop over the nose will tighten if your horse resists, yet will give instant release when your horse complies. Handy to carry around in your pocket at all times and to take with you when riding out. Available in all sizes and lots of colours.